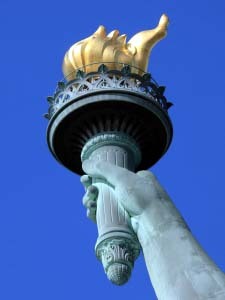 How is the flame on the Statue of Liberty related to a museum in Troyes, France, that celebrates ancient manual skills? Few artisans can match the accomplishments of Serge Pascal, master repousseur. (Repoussage, for which there is no easy English equivalent, involves hammering on a sheet of metal over a curved anvil to create relief. The various concave and convex bulges may be shaped to resemble a flame or plants and flowers or even a crown.) At 64, Pascal has completely rebuilt major parts of two national monuments located an ocean apart and separated from each other by centuries of purpose and concept. Yet both works of art were done using many of the same basic hand tools and techniques passed down over centuries. Pascal and his fellow workers spent two years rebuilding the flame on the Statue of Liberty. It was completed in time for the statue’s rededication on July 4, 1986. After returning to France, Pascal eventually became the director of a new institution that is now unique in the world, the Maison de l’Outil et de la Pensée Ouvrière (the Center for Tools and Craft Philosophy). He remained its director for 11 years. Subsequently, Pascal made use of his skills to replace the main gateways to the Palace of Versailles. The originals were destroyed during the French revolution. The photo to the right shows the courtyard of the 15th century building which houses the Center. The building was completely restored by artisans using the same techniques and many of the same tools which were used to build France’s cathedrals and castles. Repoussage, Pascal’s particular skill, is one of the 48 trades represented in the Maison de l’Outil, a half-timbered Renaissance building hidden away on a narrow cobblestone street in the medieval city of Troyes. 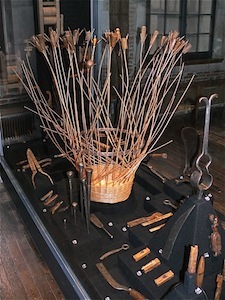 The Maison includes a stunning showcase of hand tools. These are the type of tools skilled craftsmen used to construct the hundreds of churches, cathedrals, chateaux and splendid public buildings that help fill the architectural treasure chest of France. Of the collection of some 10,000 hand tools, 8,000 are on display in 60 elegant glass enclosures. They represent 48 different trades. Most of the tools on display are from the 18th and 19th centuries. Many have changed little since the medieval period during which France’s great gothic cathedrals were built. The most prominent of the Maison’s exhibits are those dedicated to the blacksmith. The massive anvil that is used as a logo for the Center is displayed with a battery of tools used in the forging and shaping of iron. Hammers, tongs, anvils, anvil hardies, chisels, files, rasps and vises are displayed as well as fire pans and bellows. 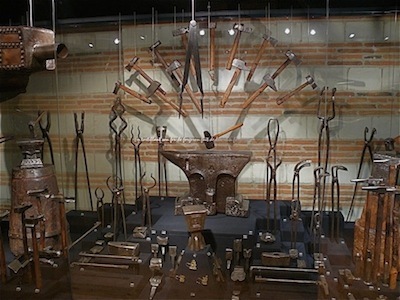 Tools are frequently arranged as they were used, so the visitor can easily imagine how they were employed. The workshops of barrel makers (tonneliers) are jewels of museum exhibition art. This manner of exhibition is repeated for the wheelwrights and cartwrights (charrons). In the exhibit of vannerie, or cane basket making, a half-finished basket with small wooden dividers on the end of each cane helps you to envision how the universal basket was made. We learn from a side panel accompanying the leather-tanning exhibit that the father of Louis Pasteur was a tanner. Son Louis later became famous for his development of the rabies vaccine and particularly pasteurization. It is likely that Louis helped his father to tan hides well before the latter discovered his son had other talents. Photographs depicting artisans at work during the 19th century accompany some displays. Thus we learn that a woman, Juliette Caron, became a master charpentier (building framer) in 1882. She helped build the casernes (military barracks) in Montluçon. Another photo shows barrel makers standing beside examples of their work at the entrance to a small workshop in the Bordeaux region. At seven locations, TV screens show videos about a particular craft. In one, blacksmiths are shown forging two pieces of iron together, then hammering the finished piece, still glowing hot, into the desired shape. The videos are in French, but are easy to follow. And though all texts in the Center are also in French, audio guides in English are available to help explain the various exhibits. Troyes is located at the conjuncture of the Champagne and Burgundy regions. It can be reached in 1.5 hours by frequent train service from the Gare de l’Est in Paris. The town sits on a wide curve in the Seine, which is navigable at that point. The people are friendly and most remember that their city was liberated in 1945 by units of Patton’s army. 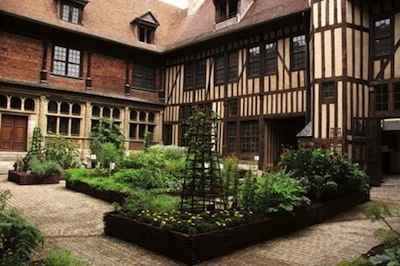 Today Troyes has refurbished its ancient center. The traditional half-timber and adobe brick style (colombage) is prevalent. Many of the city’s hotels are within walking distance of the train station. Restaurants are numerous and reasonably priced. The central covered market is an artistic feast. 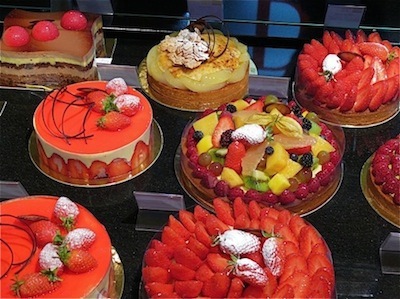 Butchers, pastry chefs, delicatessens, fish and seafood merchants, cheese vendors, and fruit and vegetable sellers compete to organize their produce and products into a cornucopia of gastronomic temptations. A specialty of Troyes that is known throughout France is one that would make most Americans hesitate. Chitterling sausage (Andouillette de Troyes) is a mixture of cleaned pork intestines and lean scrap meat from a pig’s head, plus trimmings from the cutting table. This mixture is stuffed tightly into a large pork intestine. It is best served grilled with golden pommes frites and a good red Burgundy.